↑ Delman, Edward (February 26, 2015). "An Anti-ISIS Summit in Mecca". The Atlantic. ↑ Brown, Nathan J. (September 2011). Post-Revolutionary al-Azhar (PDF). Carnegie Endowment for International Peace. p. 4. Retrieved 4 April 2015. ↑ Roy, Olivier (2004). Globalized Islam: The Search for a New Ummah. Columbia University Press. pp. 92–3. Retrieved 4 April 2015. 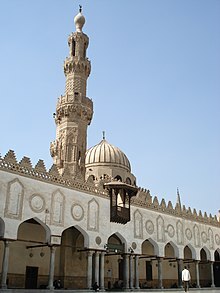 In Egypt the number of teaching institutes dependent on Al-Azhar University increased from 1855 in 1986-7 to 4314 in 1995-6. ↑ "Al-Azhar University". Encyclopædia Britannica Online. Encyclopædia Britannica. Retrieved 2015-08-19. ↑ "AME Info, 26 September 2005". AME Info. Archived from the original on 19 April 2010. Retrieved 2010-03-21.